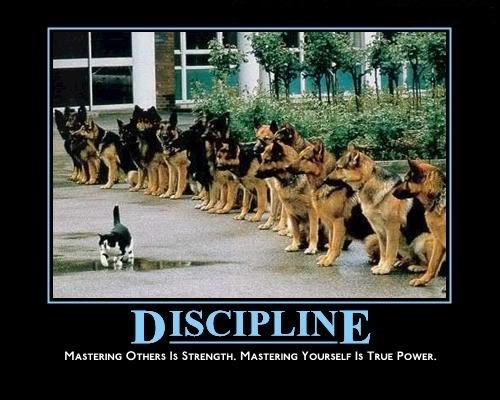 Discipline…What Does it Mean to You? Discipline is a strong word which elicits emotional feelings within us. What comes to mind when you hear the word discipline? The likely image is a helpless person cowering away as another barks commands in an effort to place their will upon them. How about the term plate discipline – what comes to mind now? The pitcher nibbles around the plate with tempting options, yet the batter patiently waits for a pitch in the zone which can be driven back with authority for a hit. In success and adherence to achieving goals, this is likely a better image to maintain. In daily life there are many tempting “pitches” which come our way. Many of these temptations are distractions which will lead us even farther from achieving our goals. The smell of hot, freshly salted french fries floating through the air is just one example which can quickly lead a dieter off track. Yet, if that individual can elicit some discipline for a few brief seconds, the temptation begins to disappear. By overcoming the distraction, adherence to a new and healthier lifestyle grows that much stronger by following through with the appropriate action. By re-programming the word discipline to stand for “making and acting upon appropriate decisions in times of temptation”, achieving long-term goals may be more readily attained. As the holiday season approaches and temptations abound, the opportunity arises to build some momentum for showing discipline. This mindset will come in even more handy as those difficult resolutions arise in early January. Great thoughts on discipline. The first thing that came to my mind was the discipline to train everyday (even when you don’t feel like it). Greatness is not a big moment that just pops up in front of an athlete. It is the daily discipline getting better everyday that allows them the chance to be great. Keep up the good work. Thanks!